INGOLSTADT, Germany, Mar 4, 2010 - Fascination taken to a new level of intensity: The Audi R8 Spyder 5.2 FSI quattro combines breathtaking performance with the experience of open- top driving. 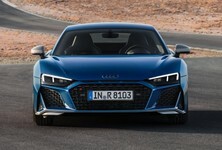 The 386 kW (525 hp) V10 engine accelerates the high- performance sports car with the lightweight cloth top to 100 km/h (62.14 mph) in 4.1 seconds on its way to a top speed of 313 km/h (194.49 mph). The Audi R8 Spyder 5.2 FSI quattro features a fascinating package of technologies, including the Audi Space Frame (ASF) made of aluminum and carbon fiber composite, quattro permanent all-wheel drive, LED headlights and the innovative seatbelt microphone. 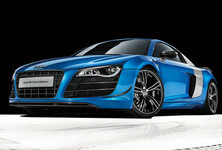 The Audi R8 Spyder 5.2 FSI quattro captivates from the very first glance. Its lines offer a unique interpretation of the dynamics and emotion of a high-performance sports car. Two distinctive silver cowls, into which the large air intake openings are integrated, give the long back a powerful profile. Unlike the Coupé, the Audi R8 Spyder has classic air intakes behind the doors. The rear side panels and the large cover over the storage compartment for the cloth top are made of a carbon fiber composite. TheAudi R8 Spyder 5.2 FSI quattro sports a cloth soft top in classic Audi style. The soft top’s approximate weight is a mere 42 kilograms (92.59 lb); it thus keeps the vehicle’s total weight and center of gravity low. When closed it melds harmoniously into the design line – it ends in two slim fins that extend toward the rear and have a contour similar to that of the Coupé hard top. 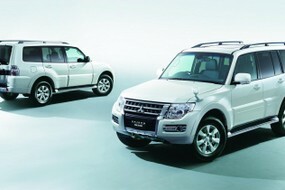 The top is suitable without restriction for high-speed driving and is quiet. With the standard electrohydraulic motor, the top opens and closes within 19 seconds, even while driving at speeds up to 50 km/h (31.07 mph). The heated glass window is integrated separately into the bulkhead and can be raised and lowered via a switch with the soft top up or down. 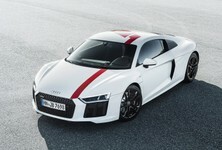 Audi also provides a wind deflector that can be installed in just two steps. The bulkhead includes integrated rollover protection in the form of two pretensioned plates. The aluminum Audi Space Frame (ASF) body of the R8 Spyder is reinforced at important locations, yet it tips the scales at a mere 216 kilograms (476.20 lb) – just six kilograms (13.23 lb) more than the Coupé. Equipped with a manual transmission, the high-performance sports car weighs only 1,720 kilograms (3,791.95 lb). 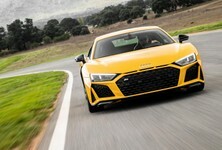 The new top-of-the-range Audi R8 Spyder offers incredible performance. The free-breathing V10 with the aluminum crankcase features direct gasoline injection. The 12.5:1 compression ratio that the FSI concept enables contributes to the high performance and good efficiency. Dry sump lubrication, another motorsport technology, ensures the reliable supply of oil even at the maximum lateral and longitudinal acceleration. The 5.2-liter engine produces 530 Nm (390.91 lb-ft) of torque at 6,500 rpm and 368 kW (525 hp) at 8,000 rpm. Its specific power output is 100.9 hp per liter of displacement; each hp only needs to move 3.3 kilograms (7.28 lb) of weight. The R8 Spyder 5.2 FSI quattro accelerates from zero to 100 km/h (62.14 mph) in 4.1 seconds on its way to a top speed of 313 km/h (194.49 mph). The engine offers amazing thrust and hangs tenaciously on the throttle in every situation accompanied by that unmistakable ten-cylinder Audi sound.